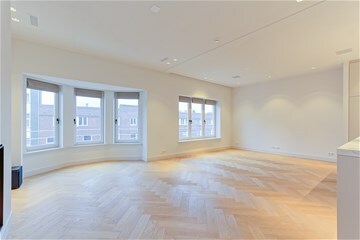 De Lairessestraat 96 AMSTERDAM, Museumkwartier - Peter Bruin Makelaardij o.g. 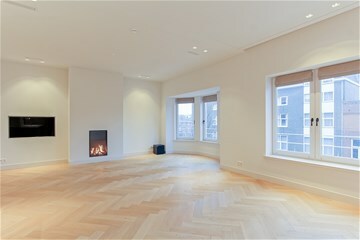 b.v.
De Lairessestraat 96, 1071 PJ Amsterdam. 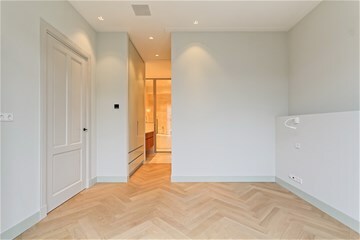 ELEGANT URBAN LIVING IN A BRAND NEW RENOVATED APARTMENT LOCATED IN THE AMSTERDAM MUSEUM DISTRICT, ON WALKING DISTANCE OF THE VONDELPARK. Top of the range semi-furnished apartment of approx. 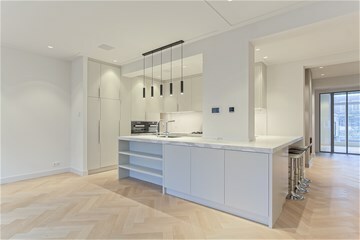 200 m2, situated in a luxurious apartment building with elevator. 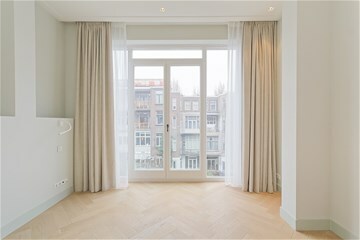 This light and bright apartment is situated on the second floor of a stylish apartment building, located on an excellent residential location in the popular and elegant Amsterdam Old-South area. 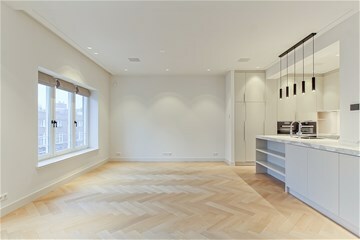 De Lairessestraat is located in the heart of the prestigious Museum District. 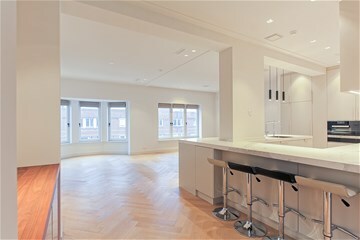 on Cornelis Schuytstraat, P.C. Hooftstraat and van Bearlestraat all within walking distance. Also the Vondelpark and a variety of restaurants and bars can be found in the vicinity. 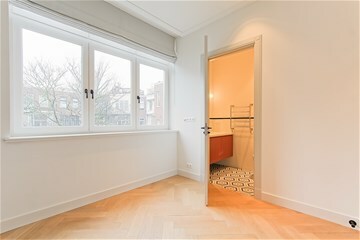 All the Amsterdam culture and pleasures can be found on walking distance of the apartment. 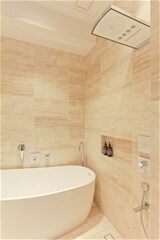 The location is easy accessible by public transport as well as by car. The apartment is only a short drive away from the highway A-10 and on a short walk from various public transport connections. 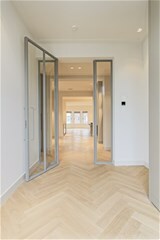 Communal entrance hall in the building with acces to the ELEVATOR. 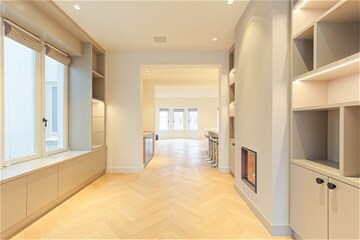 Second floor : communal entrance hall and access to the apartment. 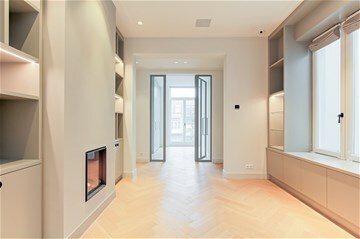 Private entrance hall in the apartment with fitted wardrobes, guest toilet and access to all rooms. 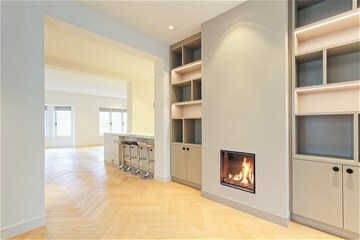 Elegant library with open fire-place and custom made bookcases. 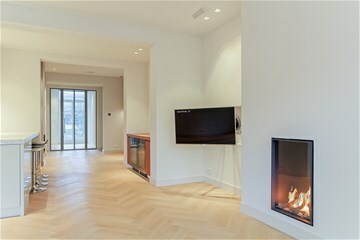 Light and bright L-shaped living room with open fire place and TV. 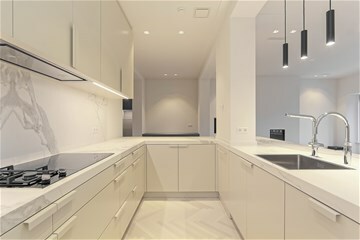 Dining area and open floor plan kitchen. 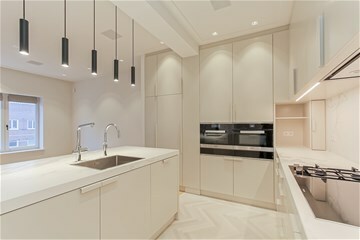 Top of the range modern custom made kitchen with integrated appliances. 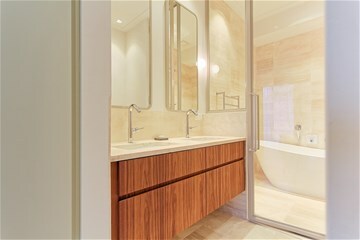 Luxurious masterbedroom with dressing room and bathroom en-suite. 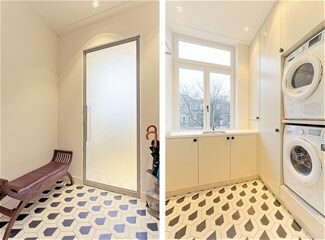 The dressing room has fitted wardrobes and gives access to the bathroom. 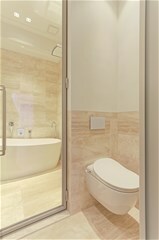 Two equal size bedrooms with fitted wardrobes bathrooms en-suite. 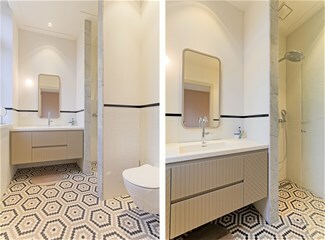 Both bathrooms have a toilet, walk-in shower and wash-basin. Spacious utility room with storage and washer + dryer. The entire apartment has a full domotica system and an alarm. 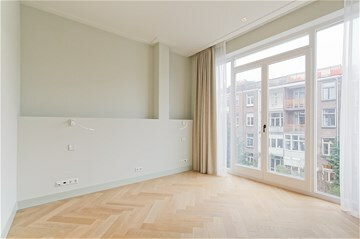 * Brand new renovated apartment with ELEVATOR. * Approx. 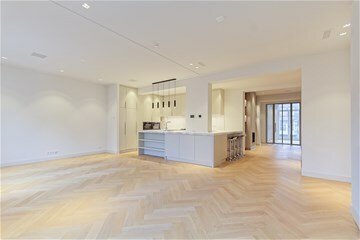 200 m2 living space, all on one floor. * Full Domotica system in the apartment. * Top of the range quality finishings and insulation. * Open floor plan apartment. 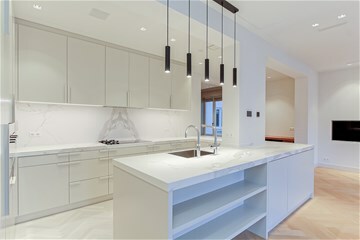 * Luxurious custom made kitchen with integrated appliances and hot water cooker and sparkling water. 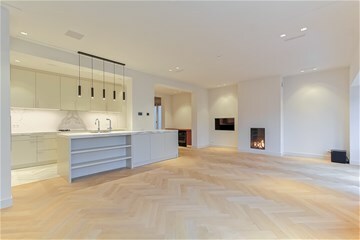 * 2 gas open fire places. * In total 3 bedrooms. * in total 3 full bathrooms. * Extra guest toilet ( in total 4 toilets in the apartment ). 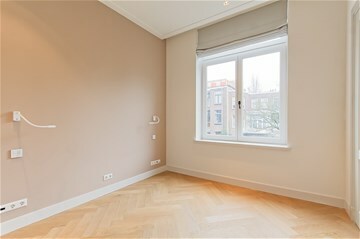 Rental price : € 7.500,-- per month excluding utilities and advanced payment for central heating.